If uncertainty is the greatest common denominator, ambiguity is a means to unite the parts…. Only accountable to ourselves, Who told you so?! 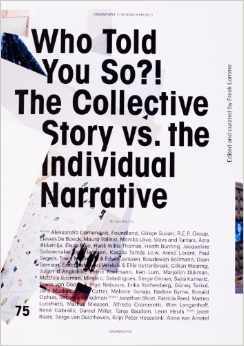 The collective story vs. the individual narrative challenges states of social ambivalence within various levels of cohesion: government, organization, scene and family. Abstractly informing our collective subjectivity and practically nurturing our personal, existential momentum, here we may inform our experiences along the lines of the poetical and critical postures presented. The postures included here inform on our whereabouts. Having the opportunity to feed our individual narrations, we may enable ourselves to challenge the collective stories written to us. Come and play upon ambivalence in cohesion’s truths and face up to what we might consider ambiguous! You can go your own way, rely on your friends or vote for someone to represent you: all this is possible thanks to the conditions created by democracies. Every day we join different groups, we withdraw from them or we are not allowed to take part in them. In our freedom we also find restrictions. The concentrated gestures and scenarios in this book offer surprising and revealing perspectives of the conditionality of individual freedom within the social configurations in which we find cohesion. Fascinating, relevant and intriguing, now that collective freedom is at odds with individual liberties and individual liberties are at odds with the collective associations by which they should be represented. Belonging to any group makes you an accessory and if you don’t belong, you are not allowed to assume that responsibility. Whatever happens if you belong to a group without wanting to, we usually do not know… We live in times of great social ambiguity. Trying to find new challenges and widening perspectives, often double-tongued as well as hiding a secret agenda, this project looks for deeper relations. Forty artists, ten writers and four poets use their astute authors’ skills to offer a thought-provoking ambiguity. This book will offer conformists an insight into the restrictions of freedom they are responsible for, will inspire freethinkers who feel they lack something and try to find a position, and it will provide recognition to those who feel oppressed.